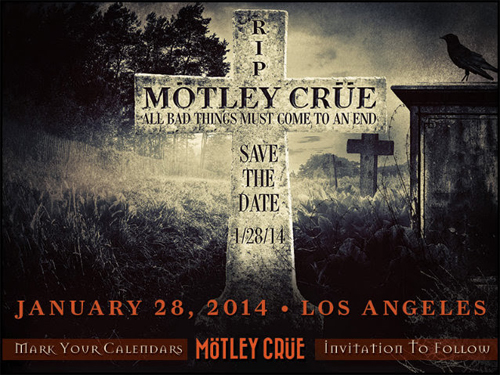 KNAC.COM - News - MOTLEY CRUE To Announce Farewell Tour? MOTLEY CRUE To Announce Farewell Tour? Mark your calendars! MÖTLEY CRÜE has announced a special 'event' in Los Angeles on January 28 under the moniker "RIP: All Bad Things Must Come To An End". It's anticipated that the band will announce the first details of its farewell tour, which will likely last for a couple of years. In a recent interview with RollingStone.com, bassist Nikki Sixx was asked about the time table for the band's eventual farewell tour, which singer Vince Neil had said could begin as early as May 2014. "We haven't decided when that is, we're talking about that," Sixx said. "It'll happen, but we don't know when it will happen. The most important thing about a farewell tour is that the band doesn't lie to the fans, and the band doesn't tour and then come back years later. That's what's important for us, planning what's the right time to go out." The band recently wrapped up its second Las Vegas residency at the Hard Rock Hotel’s Joint last October.